There are two species of Daboecia. One is found only in the Azores and is sometimes treated as a subspecies of the more widespread St Dabeoc’s heath which inhabits western Ireland, and also ranges from south-western France through northern Spain into the north-west of Portugal. In cultivation these two species have accidentally hybridized and the hybrid is now a popular garden plant. Low-growing or dwarf, evergreen shrubs that prefer acid soil. They have relatively large, elliptical, leathery leaves which are white or silver underneath, and the large, urn-shaped flowers, ranging in colour from white through lavender to deep purple, arranged erect spikes in summer. In gardens, St Dabeoc’s heaths tend to have two flushes of flowers, the first in early summer and another in early autumn which continues until frost occurs. They are useful plants for ground-cover and for intermixing with other dwarf shrubs such as western gorse (Ulex gallii). They are particularly effective when planted in drifts of mixed flower-colours. St Dabeoc’s heaths tend to become straggly if not pruned annually. They can tolerate a little shade and are more resistant to drought than most heathers. Heather flower colours are usually defined by 16 colour groups called H1-H16. See the Heather Colour Chart for details of these colours. The H1-16 definitions for colours should not be confused with hardiness zones. Cultivar lists can be found highlighted in blue throughout the text for each species. Dwarf shrub, to 20cm (8in) tall, spreading to 40cm (16in), distinguished from Daboecia cantabrica by the smaller leaves and the lack of hairs on the ruby (very rarely pink or white) flowers. Suitable for USDA zone 8. When regarded as a subspecies of Daboecia cantabrica its name is Daboecia cantabrica subsp. azorica. In the Azores, this heath grows in very well drained volcanic gravels, so it does best when provided with similar conditions in gardens. However, it is most uncommon and difficult to obtain, and only one cultivar has been distinguished and named. Sprawling or compact shrub, to 40cm (16in) tall, spreading to 70cm (28in); leaves glossy, dark green 1.5cm (2/3in) long, 6mm (¼in) wide; flowers about 1cm (3/8in) long, usually lavender, summer to autumn. Suitable for USDA zone 6 with protection but some winter damage can occur if planted in heavy ground or frost pockets. 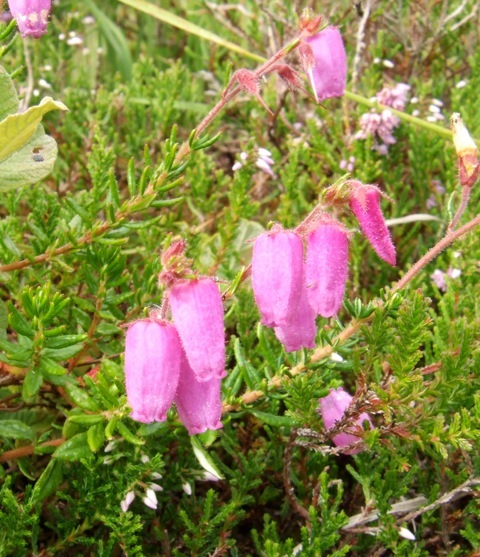 St Dabeoc's heath, Daboecia cantabrica, is native in Ireland. 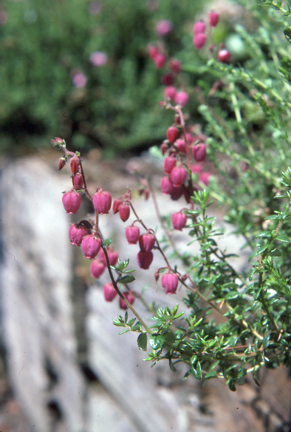 A hybrid of garden origin between Daboecia azorica and Daboecia cantabrica: when these are regarded as subspecies (an opinion not maintained by The Heather Society), the hybrid is named Daboecia cantabrica nothosubsp. scotica. Compact shrub, to 20cm (8in) in height, spreading to 45cm (18in); leaves are glossy, dark green, smaller than those of Daboecia cantabrica; flowers white to crimson, summer to late autumn. This is ideal for ground-cover in the smaller garden and for use in tubs, troughs and hanging baskets. Suitable for USDA zone 6. 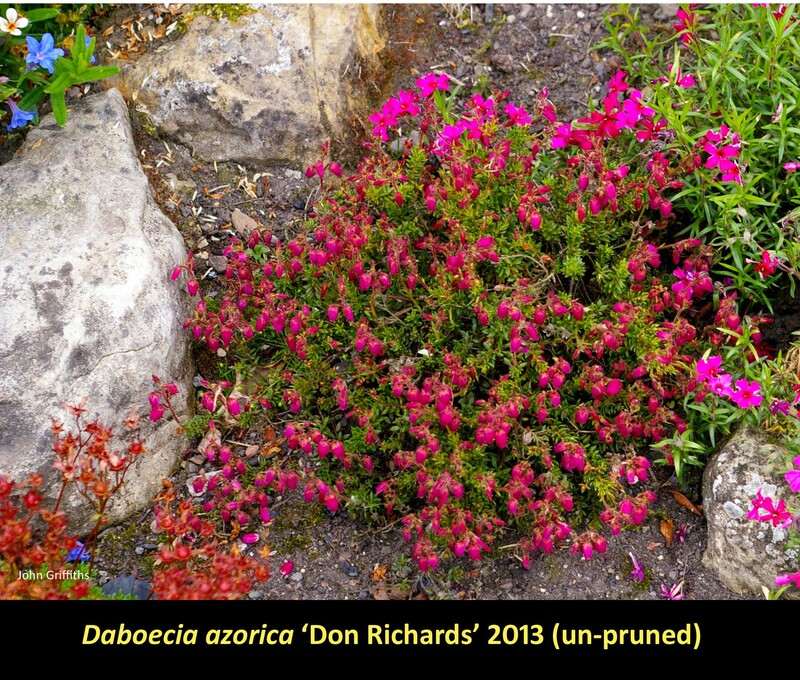 Daboecia derives from the Irish name for this heather, fraoch Dabeoc, recorded in the late seventeenth century by the antiquarian Edward Lhuyd. Dabeoc (pronounced da-vock)* was perhaps the youngest son of a Welsh chieftain who founded a monastery on an island in Lough Derg in County Donegal Ireland. When Latinized, the 'o' and 'e' were reversed, an error that has been perpetuated ever since. E. C. Nelson, 1984. Dabeoc – a saint and his heather. Yearbook of the Heather Society 3 (2): 41–46. E. C. Nelson, 2000. A history, mainly nomenclatural, of St Dabeoc’s heath. Watsonia 23: 47–58.